Do large fashion brands excite you and make you want to spend your life savings on their latest handbag? Are you constantly reblogging, tweeting, instagramming the latest fashion trendsetters? This is the power of marketing and we want to help you master it. Fashion marketing is a rapidly growing sector and Raffles gives you the unique opportunity to study a degree at the intersection of fashion and business. Fashion excites you but the thought of making a garment stops you from pursuing it as a career. You much rather think of how to create an image around that garment and how to sell it. You want to be the one forecasting what will come and set the creative and strategic direction of the brand instead of designing the collections. And when the products are being created, you are already planning your next move. You have an eye for style but know that clothing need more than nice detailing to sell. You know how a good story and strong images can change people’s perception of really anything, and you’d like be one of those storytellers. 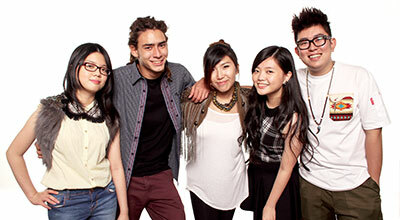 WHY CHOOSE A FASHION MARKETING COURSE AT RAFFLES? As the fashion and retail sectors grow, fashion marketers are in constant demand. Raffles offers the only bachelor degree in fashion marketing in Australia, so you’ll have a competitive edge that your potential fashion house employers dream of. Your lecturers are all industry professionals, who will guide you through your degree to make sure you’re given the latest market updates and knowledge. You’ll work on professional briefs, often with real clients who understand the industry standards. You’ll work on fashion business and marketing proposals and build a professional portfolio that will give you a serious head start when going for that first job. In the final stages of your degree you will have mastered your presentation skills to pitch your ideas to both lecturers and industry guests. The Bachelor of Design majoring in Fashion Marketing is a full-time, 3-year degree available at our Parramatta campus. The course exposes students to countless opportunities in the fashion industry. It is tailored to blend creative fashion knowledge with business, marketing and contextual studies. Students learn about buying and merchandising practices as well as conceptualising and developing effective brand management strategies to execute advertising and promotional activities. They study how product, customer and market forces interact and get an introduction to the new challenges, technologies and issues facing the fashion industry. The BA (Hons) International Fashion Business course is designed to offer an opportunity to study international fashion business in a creative environment to students with a range of ambitions and interests in fashion who do not, however, aspire to be fashion designers. Students will reflect on global and regional trends in their work and will develop a style that reflects the Asian market, but also allows true global employability. This course will offer students an understanding of the different roles in the fashion industry from trend analysis and prediction, through to the design, manufacture and the retail of products, and the role of marketing to the global consumer. The experience of working in partnership with Fashion design students will give students a real insight into the role of the fashion designer in the industry, and will therefore offer the students an advantage on graduation. Students will be able to tap into the broad range of available career options (including buying, merchandising, marketing, branding, and launching their own businesses and will be encouraged to exhibit their own, diverse interests in the work they produce. BA (Hons) Fashion Communication at Northumbria offers you the opportunity to explore the communication of fashion through images, experiences, film and the written word. Learn how to create a fashion magazine, turn your blogging skills into an exciting career, plan a fashion show or predict consumer and lifestyle trends! The course addresses the visual, practical and cultural demands of an ever-changing society and dynamic fashion audience, You will work on real-life creative briefs, giving you practical experience within an industry context. You will graduate having learned how to set up a live business and will build your professional and entrepreneurial skills.